SECCHI is participating in a NASA campaign to observe Comet ISON. A description of planned observations may be found at the SSC website. For the latest news, see the ISON campaign blog. Comet C/2011 W3 (Lovejoy) is observed by multiple spacecraft! SECCHI is a suite of 5 scientific telescopes that will observe the solar corona and inner heliosphere from the surface of the Sun to the orbit of Earth. These unique observations will be made in stereo for NASA's Solar Terrestial Relations Observatory STEREO. The suite has three main parts. 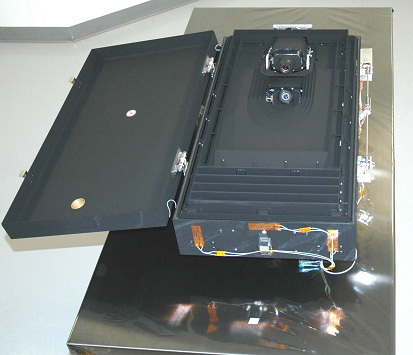 The SCIP (Sun Centered Imaging Package - three telescopes), the HI (Heliospheric Imager - two telescopes) and the SEB (Secchi Electronics box). 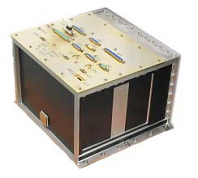 The STEREO mission is the third in the line of Solar-Terrestrial Probes (STP) and is a strategic element of the Sun-Earth Connections Roadmap. STEREO is designed to view the three-dimensional (3D) and temporally varying heliosphere by means of an unprecedented combination of imaging and in situ experiments mounted on virtually identical spacecraft flanking the Earth in its orbit. The primary goal of the STEREO mission is to advance the understanding of the three-dimensional structure of the Sun's corona, especially regarding the origin of coronal mass ejections (CMEs), their evolution in the interplanetary medium, and the dynamic coupling between CMEs and the Earth environment. CMEs are the most energetic eruptions on the Sun, are the primary cause of major geomagnetic storms, and are believed to be responsible for the largest solar energetic particle events. The two spacecraft will be launched together and will use a gravity assist from the moon to slingshot the spacecraft into a heliocentric orbit. The first to enter heliocentric orbit will be the Ahead (STEREO-A) spacecraft and then two weeks later the Behind (STEREO-B) spacecraft. The two spacecraft drift away from Earth at an average rate of about 22.5 degrees per year. After the two year nominal operations phase the spacecraft will be about 90 degrees apart, each about 45 degrees from Earth. STEREO-A will drift ahead of Earth and STEREO-B behind. In order to accomplish this drift, STEREO-A will be traveling faster than Earth around the Sun and so must have an orbit slightly closer to the Sun than Earth's. Similarly, the STEREO-B must be traveling slower than Earth and must have an orbit slightly further than Earth. The orbits are shown in the Java tool along with the planets and the orbit of the sun-grazing comets in the Kreutz group. It is now since STEREO launch at 8:52pm EDT Oct 25, 2006 from Kennedy Space Center in Florida atop a Delta II rocket.